This past Wednesday night I spent two hours cleaning up messes my kids left all over the house in an embittered, martyr-esque it’s-a-good-think-everyone’s-asleep-so-I-have-nobody-to-scream-at rage. And for those 120 minutes I realized the extent to which my younger kids feel no sense of responsibility for the cleanliness of the house. And that’s why, day after day, the legos are left on the carpet for me to pick up and the half-finished bowls of soggy cornflakes are left on the table for me to wash and the pre-bath clothing is left on the bathroom floor for me to put into the laundry. 2. Divide each circle into as many pie slices as you have kids who are old enough to help in the house, and label the inner pie slices with their names along with how many minutes each one will need to help in the house each day. For example, I wrote that my 5-year-old needs to help for 5 minutes and my 6 through 12 year old need to help for 15 minutes (my 15-year-old isn’t on the chart, she helps half-an-hour a day). 4. Label the outer circle with 4 jobs/areas of the house. 5. Every day rotate the little circle one pie-slice over, so every child gets each job once every four days. The inner wheel contains the names of the children who are old enough to help in the house: Hallel, Maayan, Moriah, Yoel along with the amount of minutes they need to help. The outer circle contains the same amount of jobs as kids in the inner circle: kitchen, living room/entrance, upstairs, laundry. Every day you rotate the inner wheel so every kid gets a new job. That’s it! So I just started using it on Sunday and my kids are into it…I hope their into-it-ness will last. I’ve had this chart for a few years, so (in theory) kids can mark down when they finish their daily chore. This means (once again, in theory) that I don’t have to chase after them to make sure they did the chore they were supposed to. After they check off that day’s box, they receive a treat. And our new resolution since my Wednesday cleaning marathon: no computer until job is done. I recommend making something your kids enjoy conditional upon finishing their chore (i.e., dessert, reading, bedtime story, computer time). 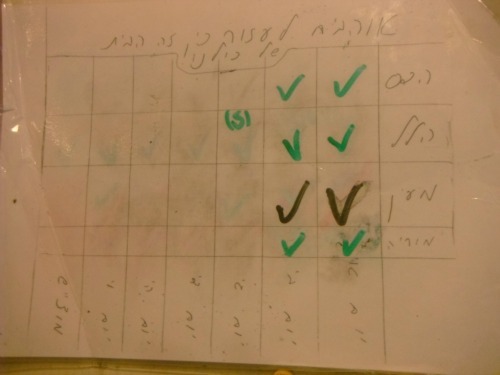 The days of the week appear on the top of this chart, and the (IY"H) chore-performing children's names appear on the side. On the top I wrote "We all love to help because this home belongs to all of us!" (children's reaction to this peppy sentiment: "Yeah, right Eema...get real!!!" Last night we had a meeting to talk about keeping the house clean. I tried to make it fun and positive, so I called it a “house party” and served chips with salsa and bamba etc. During the meeting we talked about how we can keep the house cleaner, and my kids had a lot of strong opinions about various things related to the house, so my daughter wrote up all of the rules we agreed upon, and I laminated them and posted them next to the chore wheel for all to see. Our house rules include: 1. All children must make their beds every day with only one doll left on them. Always try to look around your bed and clean up. 2. Once every two weeks Eema checks to see if bedrooms need cleaning. And if they do, every child will clean his/her room instead of that day's chore. 3. (This rule,that was decided after about twenty minutes of heated discussion, relates to the requirement of parental permission to enter another child's bedroom), 4. After you eat, clean up after yourself. Wash the plate and put ingredients back in cabinets and fridge. For chores that involve “work”, I want to make sure that my kids at least know how to do these things well, as they are life skills. So, for example, even my second grader knows how to clean a bedroom (including vacuuming, rolling up rug, sweeping, opening up the window and then washing the floor). When the kids have time (e.g., when they are off on Friday), or when I need help, I will ask them to help and it is a pleasure that they know how to do a proper job. It might be ideal if they had a regular schedule for helping, but we have not gotten there yet. For chores that should be “habits”, my goal is to help ingrain these habits in the kids, because they are what a mensch does. 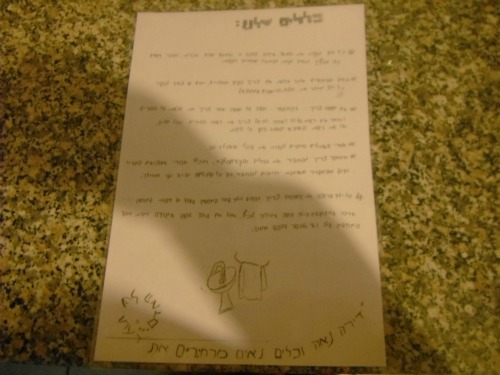 I want my kids to have derech eretz and that involves putting their bowls in the sink. My kids dont actually mind doing these things, they just forget. So, I did a lot of reminding for these with no success at all. Finally, I realized that reminding a kid to put his bowl in the sink only ingrains in his mind the connection between being reminded and putting a bowl in the sink. But I needed the connection between finishing eating and putting the bowl in the sink! So, the reminding was not helping to form the proper habit and it was extremely frustrating for me! I decided that I needed a way to make the kids want to remember. I ended up using the site http://www.goalforit.com/ to encourage these habits, for about 2 months. (During the time we used the site, I did not do any reminding of good habits at all, but the kids just wanted to remember and were upset with themselves when they could not put the sticker on their virtual charts.) Now, we are about four months after stopping to use goalforit, and I see a significant difference in that some (unfortunately not all yet) of these things have become actual habits, and are done automatically with no reminder needed! My ALL TIME favourite chore encouragement: The MARBLE JARS. Buy a big bag of marbles or large beads etc. Give each child a see-through jar, labelled, and placed where they are visible. As jobs get done, the jars get filled. Have different jobs worth certain amounts of marbles. I had “one-marble jobs” and “two-marble jobs”. 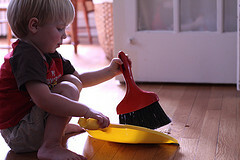 Whenever I caught one of the kids doing something, I’d say, “Hey, that was a one-marble job! ” They’d get very excited and then of course the rest of the kids would then scramble to earn some marbles. When each child would finish their jar they would get taken on a special trip alone to the toy shop to choose a gift (with a monetary limit, of course). My son earned almost his entire playmobil collection with his jar! thank you for posting this. 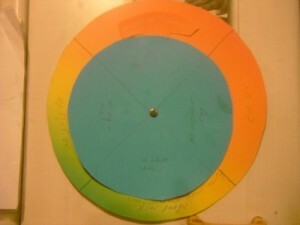 I have always wanted to give my kids chores but I got very stuck with charts and figuring out which kid gets which chore and when- I anticipated complaining, fussing, etc… I borrowed your jobs- living room, dining room, kitchen, and laundry and made a wheel like yours and so far its working. so thank you so much (my oldest daughter thanked me also tonight because she said it makes her feel good to help). I also fretted over what to give as an incentive- money? prize? now I realize that simple is best so i will give a small treat or a shekel or two. that’s amazing to hear, so happy I posted it! I just re-read this post. Thanx everyone for your great ideas!